A-class catamarans race in Coronado’s Crown Cove, Oct. 5-8. SAN DIEGO ― A-class catamarans take to the waters of Coronado’s Crown Cove, Oct. 5-8. 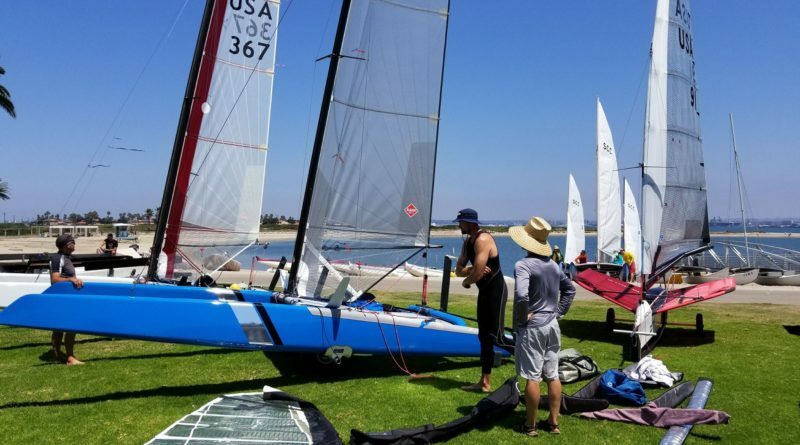 San Diego Yacht Club hosts the 2017 A-Cat North American Championship. This is the first time San Diego YC hosts both the Moth North American Championship, taking place a few days prior, and the A-Cat North American Championship. The A-Cat North American Championship involves 11 races over four days with three races each day except for the final day holding two races. An International A-Class Catamaran Association (IACA) membership is required for boats to participate in this race. The IACA rules limit championships to 100 participating boats. The regatta registration fee is $275 per boat. The deadline to register is Sept. 27. Sailors with catamarans competing in this race can arrive as early as 10 a.m. on Oct. 3. A skippers meeting and reception will be held Oct. 4 at the yacht club. An after race reception will take place two days later, also at San Diego YC. The post-race awards ceremony will take place at Loews Hotel in Coronado two hours after the final race, Oct. 8. Both the Moth and the A-Cat North American Championships feature single-handed, high speed foiling. “The Moth and A-Cat North Americans will be the high performance events of 2017,” Regatta Chair Matt Struble stated. Struble was also the winner of the A-Cat North American Championship in 2015 and 2106. “The rich sailing history of San Diego Yacht Club is very helpful when organizing and running the North American Championships for boats that fly. San Diego South Bay is known as foiling heaven due to the lack of weeds, wind speeds between 10-15 mph, small waves, and warmer water,” Struble said.